This seems like an eternal question for the Saints. I jumped on the Derek Barnett train last draft. That plan flew out the window when Marshon Lattimore fell in the Saints’ lap. The Saints rolled with Alex Okafor on a one-year deal. Now Okafor’s injury complicates the situation. He looked well on his way to garnering another contract by being a nice complement to Cam Jordan on the other edge after inking a one-year deal last offseason. Then he ripped up his Achilles tendon in the Washington win. You’d think Okafor could return for the start of the 2018 season. The Saints found some lightning with George Johnson. Trey Hendrickson isn’t going anywhere. 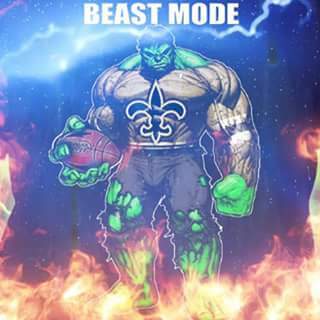 Come on Who Dat Nation ! I know we can give also to help out Morstead’s charity ! weekend. This time, however, he will be welcomed with open arms. extra-point play. That courageous display of grit and respect resonated with many Vikings fans. Click here now to learn more and to donate ! 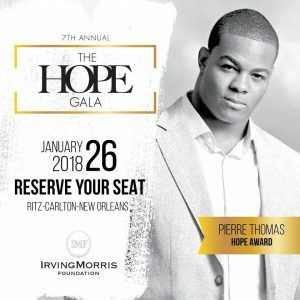 Pierre Thomas as he receives the Hope award ! IrvingMorris Foundation is proud to announce the. The evening will benefit the IrvingMorris Foundation (IMF). Over the last six years this event has been extremely successful and funds raised have helped us to provide the basic necessities of shelter, food/water and education to so many in need. IMF has built over 37 homes for displaced families and veterans in Louisiana, helped to provide over 100,000 hot meals in Los Angeles, and provided mentoring and assistance to hundreds of our youth nationwide. Our success relies on partners such as you, who truly have the desire to not only help raise awareness, but much needed funds to make a difference in peoples lives! The invitation-only black tie fundraiser will be held Friday, January 26, 2018 at The Ritz-Carlton in New Orleans, LA. This premier event includes a night of entertainment, live and silent auction, dinner and exclusive access to athletes and celebrities. 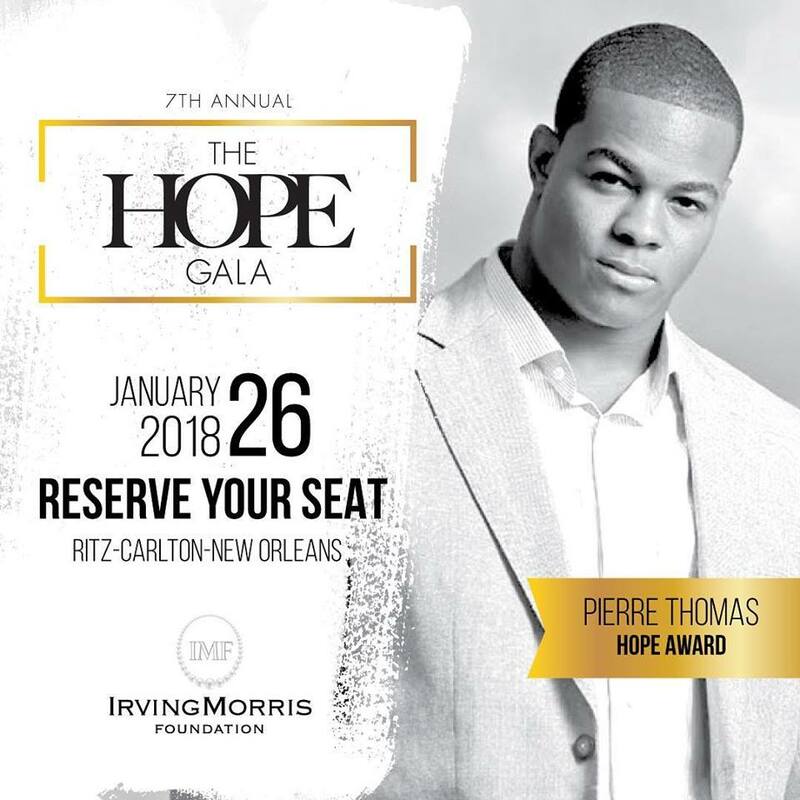 Approximately 200 guests, ranging from business executives to entertainers, athletes and the community’s most influential will be welcomed with a VIP champagne reception. Following the reception, guests will enter the Grand Ballroom and enjoy an exquisite four-course dinner while hearing messages of HOPE. The evening will conclude with a surprise live performance. This night is guaranteed to provide an experience of a lifetime, while honoring those who have made a huge impact in our community. TOGETHER WE CAN PROVIDE HOPE! CLICK HERE to get your tickets! Central City BBQ shows the love! 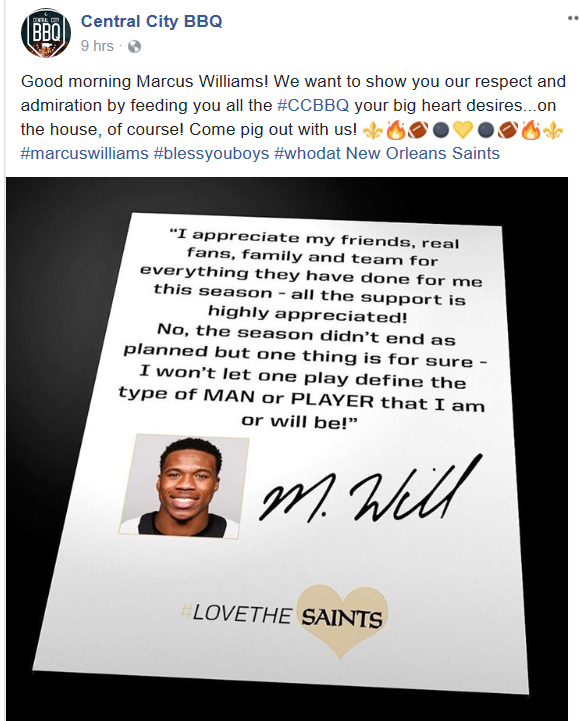 Our friends at Central City BBQ showed the love to Saints Marcus Williams ! Thanks guys, we love your burnt ends !! Posted in Who Dat's | Comments Off on Central City BBQ shows the love! Posted in Who Dat's | Comments Off on Thanks Drew ! 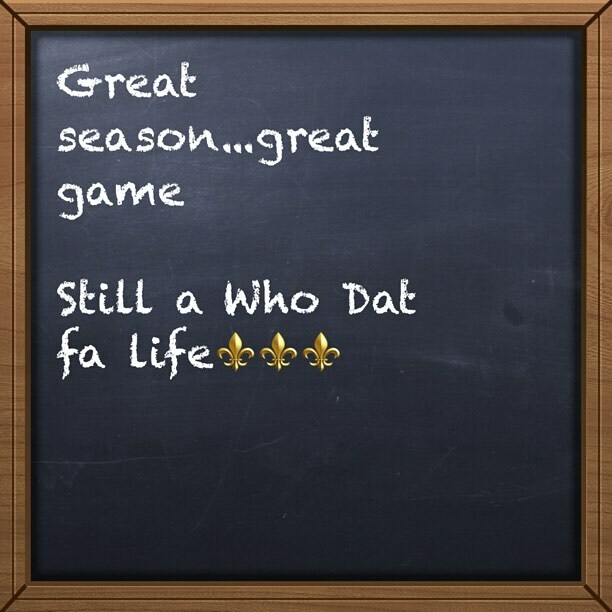 Who Dat fa life ! Posted in Who Dat's | Comments Off on Who Dat fa life ! Posted in Who Dat's | Comments Off on Beast Mode !! New Orleans enters their NFC Divisional playoff game as 4.5 point underdogs. I’ve felt going into this game that I wouldn’t be surprised if the Saints won, but that I feel they won’t. Does that make sense? I’ll explain. Seems like most of the reasons many fans believe the Saints can win can also be seen as reason for the Vikings to win. New Orleans isn’t the same team as they were in Week 1. True. The Saints first two games had NFL analysts wondering if it was time to blow up the team and move on from Sean Payton. That seems like an eternity ago. Minnesota when on to have an eight-game winning streak this season just like the Saints and finished the year winning 11 of 12 games. The Vikings won the game with Sam Bradford at quarterback and he hasn’t played since. The Black and Gold also are battling attrition as this week players 19 and 20 were placed on injured reserve and Andrus Peat became the 10th started to not finish the season on the field. New Orleans is the better offense. The Saints are the second ranked offense in the NFL averaging 391.2 yards per game as they are fifth in the league in rushing and passing. New Orleans averages 129.5 yards rushing and 261.8 yards passing. So the Black and Gold have an offense that gives them a chance to win every game. Minnesota however is the overall number one ranked defense in the NFL allowing just 275.9 yards per game. The Vikings defense rank second in the league in yards allowed on the ground at 83.6 and 192.4 yards passing. So the Vikings have a defense that gives them a chance to win every game. There’s not much you can take from the first meeting between the two teams to open the season. New Orleans had yet to find their identity on offense and the group of young players that they’ve depended were just either getting their first taste of NFL action or beginning a second season. The Vikings were a playoff team in 2015 and are just a little further along then the Saints in the process. I felt going into the first meeting that Minnesota is where the Saints would like to be to start the season a year from now. New Orleans has quarterback Drew Brees and they have Case Keenum. Brees set the regular season completion percentage record this year. He had a good year. Last week, incredibly the Panthers chose to see if Brees could be them rather than the Saints run game. That’s saying something. Brees hasn’t been the Brees of old and in part he hasn’t had to with the backfield . Brees this season was 386-536 good for a 72% completion rate to go with 4334 yards while Keenum was 325 for 481 good for completing 67 percent of his passes to go with 3547 yards. Brees had 23 TDs and 8 interceptions while Keenum had 22TDs and 7 interceptions. The quarterbacks ran the offense asked of them this season. I can’t see how Keenum will be asked to or will do anything different then what he has all season in the 15 games he has started. Third Down. Minnesota set the regular season NFL record in third down defense this season going 51/202 for 25.2%. The Saints offense is 27th in the league in third down offense. New Orleans has struggled and in a game where WR Brandon Coleman is out this could be the chance for Willie Snead to look like the receiver that was the teams go to in third downs it seemed the last two seasons. Good Start. Vikings fans will have WE DAT signs and all week spoke about getting revenge form the 2009 NFC Championship game, a game that still is talked about and stings. Their fans realize they have a shot at becoming the first time to host a Super Bowl. It’ll be key to survive the start of the game not have to play catch up in the hostile environment where communication on offense will be difficult. Special Teams. The Saints have one of the league’s best punters and in a game like this Brees likely will take a sack or throw it away then take many chances. Field position could be key and the Saints have in Thomas Morstead a player that can flip the field. Will Lutz connected on a 57 yarder last week but can be inconsistent. IF the Saints are forced into field goals, everyone will count and leaving points on the field could be a difference. Alvin Kamara. The Saints rookie running back had seven carries for 18 yards and four receptions for 20 yards in the season opener. Kamara has become more important to the offense over the season and last week we saw Carolina sell out to try and contain him. Kamara had just 23 yards on 10 carries rushing and just 10 yards on one reception in last week’s win. Kamara has got to provide more than 20 all-purpose yards this week for the Saints to win. Minnesota is the better team. They’ve been more consistent all season and the Saints following their 8-game winning streak closed the season out 3-3 with the losses all coming on the road. Injuries have taken a toll on the defense and they don’t seem to be as dominant aside from the occasional big play. The intentional grounding and sack to win the game last week were big play but Carolina’s offense had their way most of the day and were driving there to win the game possibly. Give me this game next season with a third of the Saints on injured reserve healthy and I’d take the Saints all day. This year I just have a hard time seeing the Saints pulling out a close game. 23-17 Vikings. Sunday Brunch for the Who Dat Nation ! 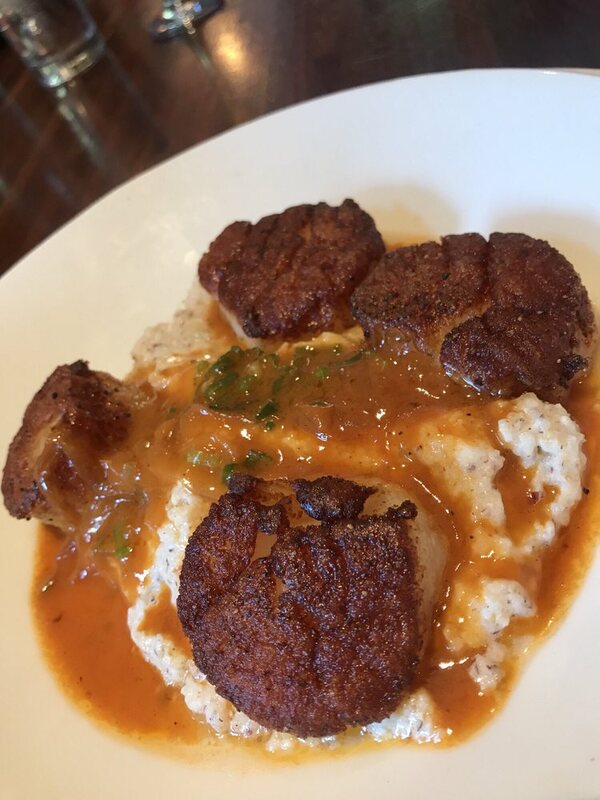 without energy, and a good meal will give you the energy you need to support the Saints all day ! For more check out their web site CLICK HERE ! Remember Brunch is from 10:30am-2:30pm ! Posted in Who Dat's | Comments Off on Sunday Brunch for the Who Dat Nation !